DIY Tip of the Day: Instant Brad Nail Holder. 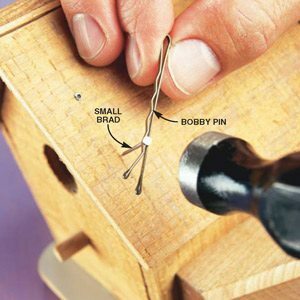 Thanks to reader Debora Sowerby, you now have another easy way to pound in little nails without pounding on your fingernails. Push the nail brad into a bobby pin—the kind with one wavy side. Tap lightly to set the brad. Pull away the bobby pin and hammer the brad all the way in.